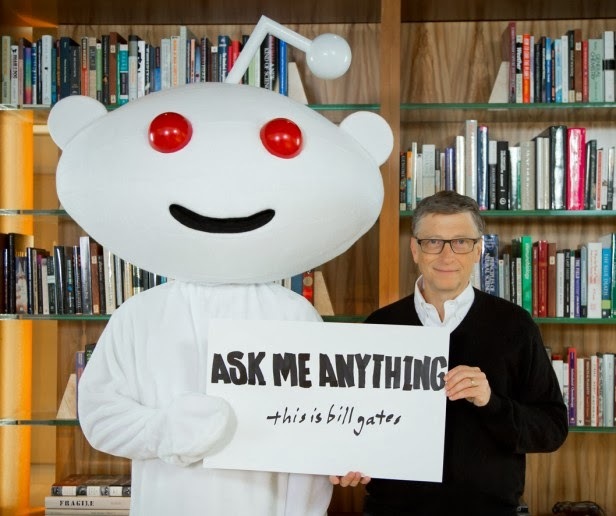 Microsoft co-founder Bill Gates communicated with Reddit users for a Q&A session. There are different type of questions he was asked but Gates answered them. Even he discussed about his new role at Microsoft that will be much more hands-on than past few years since he left the post CEO to concentrate on the charitable foundation he runs with his wife Melinda Gates. Gates expressed that he will work closely with Microsoft’s new CEO Satya Nadella in an advisory role, but also cleared that two-thirds of his time will be spent on the Bill & Melinda Gates Foundation and only one-third on Microsoft's new profile. “I will focus on product work mostly, make sure we pick ambitious scenarios and that we have a strong architecture to deliver on them. I encourage good work (hopefully),” he wrote. His main areas of focus will be on connected devices and well-integrated software. “I am excited about how the cloud and new devices can help us communicate and collaborate in new ways. The OS won’t just be on one device and the information won’t just be files — it will be your history including being able to review memories of things like kids growing up. I was thrilled Satya asked me to pitch in to make sure Microsoft is ambitious with its innovation. Even in Office there is a lot more than can be done.” he expressed about his new role. Bill Gates has been doing remarkable jobs and took beneficial decisions for Microsoft since decades and hope that he does continue the same pace with Microsoft.